Which types of sushi best test a sushi chef’s abilities? 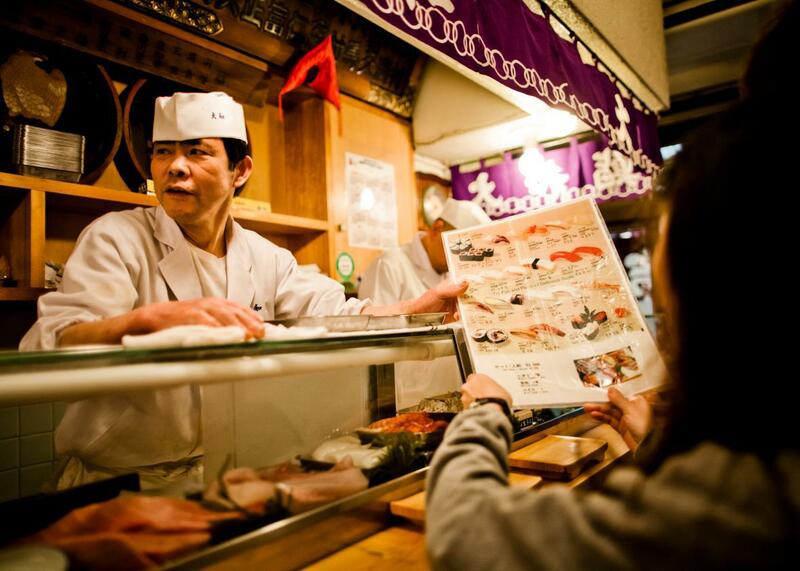 A worker checks the stock of fish with a colleague as he prepares to serve sushi at the Tsukiji Fish Market in 2012 in Tokyo. Traditional Edomae or Tokyo-style sushi chefs consider teate, or prep work, an important part of their skills. Teate consists of salt-and-vinegar curing, lightly searing and smoking, or soy marinating as the techniques to enhance the flavor of fish, carrying the tradition from the time when Nigiri was invented. Edo-style sushi chefs thrive on their teate techniques to make fish taste better than when they were raw. Therefore, any sushi showcasing the sushi chef’s teate would be a good one to test his skill. One of them is kohada, or gizzard shad. To make the perfect kohada is a challenge. The reason is in its recipe. It goes something like this: After cutting, fileting, and cleaning kohada, sprinkle some salt and let it sit for 15 to 40 minutes, then marinate it in rice vinegar for 10 to 30 minutes. If you read it carefully, you will notice that the recipe is very vague. There is nothing to tell you if you should marinate in salt for 15 or 30 minutes. The only way to understand this recipe and master it is through experience. No one can teach you—it can only be learned by each person. One must first watch other sushi chefs filet hundreds and hundreds of kohada, salting, vinegaring, watching how their colors turn and how the taste changes after a day or two. After watching the process, one must practice by doing the same, making lots of lots of mistakes until one develops one’s taste and eye to determine how long to marinate the fish in salt and vinegar and how long to let it sit before kohada is ready to be served. I suppose it’s something similar to wine-making, where one’s experience and developed senses are required, and even then you’ll never know how it will turn out in the end. Saba is another one that requires curing in salt and vinegar, just like kohada. The only difference is that it’s easier to filet and cure because saba is bigger than kohada. The other Edomae sushi that require teate are: anago (sea eel), ni-hamaguri (boiled clam), tako (boiled octopus), and ebi (boiled shrimp). Any sushi that requires no teate is not a good indicator of a sushi chef’s skill because it reveals limited techniques. Uni or toro both require very little or no teate and therefore are not a good choice of sushi to test chef’s ability. If given the same ingredients, I would say it would be very difficult to tell the difference between uni made by the master chef and the one made one a beginner—all one has to do is put it on top of sushi rice. In Japan, if you want to know how good a sushi establishment is, order tamago (egg custard). Though not fish, tamago is a good sushi to test a chef’s skill because it involves heat control. Training of tamago usually comes after a sushi chef masters the fish preparation, so good tamago means the chef has spent a reasonable amount of years in training. First, it tells you a lot about sushi rice. Because sumaki has no fish or vegetables inside, you can only taste the flavor of sushi rice and seaweed. The combination of sushi rice and seaweed is the base for any traditional Japanese sushi rolls, so it will reveal the level of chef’s skill in making sushi rice and forming the roll. It’s important to understand that one is never better than the other—just because one sushi chef uses red rice vinegar over regular rice vinegar does not automatically mean his sushi is better. It’s the reasoning behind it that matters. Second, hosomaki should have rice evenly placed so that if they are bound together, there should be some space in between rice, so that if you were to pour some soy sauce from the top, it will run through to the sushi rice to the bottom of the roll. This is very very very difficult to achieve because you need to keep each grain of rice intact when you make sushi rice as well as when you apply it on nori and roll it. According to chef Hachiro Mizutani, a former apprentice of Jiro Ono, of Sushi Mizutani in Tokyo, the only person who can make this perfect hosomaki is Jiro Ono. Because sumaki is only made when a master or trained sushi chef wants to see another chef’s skill, it’s not on a menu. In fact, if you are not sushi chef, you will never be able to order it—or more like you should never order it at all. So what should you order instead? I would order kappamaki (cucumber roll) or tekkamaki (tuna roll), both of which are thin, seaweed-out rolls. It should be enough to tell you the sushi chef’s skill. If not, how about a California roll or spicy tuna roll? I do order spicy tuna a lot to see the quality of sushi at a sushi restaurant in U.S. I visit for the first time. If after one piece you are unsure what you are looking for, keep eating until you can tell. Just as sushi chefs need lots of experience slicing fish, you also need a lot of experience tasting and sampling great sushi to develop your taste buds and senses. Sush Chefs: Why are sushi chefs usually male? Sushi: What are fail-proof rules for gauging how good a sushi place is? Restaurants: Is it odd to eat alone in a fine dining restaurant?